Should I Always Buy Near Where I Live? MANY INVESTORS start out believing they should only purchase Commercial property nearby to where they live. Basically, that stems from a desire to keep a close eye on the property. And some investors even feel they will save money through managing it themselves. However, as the number of properties you own begins to grow, you will quickly discover that you’re spreading yourself far too thin. More importantly, you’re actually creating a potential nightmare – through a failure to cope with some of the tricky compliance issues associated with Commercial property. Therefore, having a strong relationship with a good managing agent will quickly turn out to be rather cheap insurance. Besides, with many commercial leases, they are structured so you can recoup the modest management fee involved. 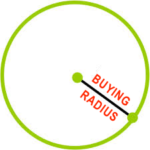 So, now that we have agreed that you should engage a competent managing agent … your official “buying a radius” can now extend to within 20 minutes of their office. This ensures they are able to respond quickly to any emergencies, which might arise form time to time. As you can see, you’re no longer constrained by where you live. And that means you can now explore opportunities across town – or even, interstate. Market conditions in a specific location. Naturally … you will need a good property adviser to help you negotiate the initial purchase. But then your focus turns to choosing the best managing agent to look after your property – one who will also help add additional value, while you own it.